Travel back to the nostalgia of your childhood with this cartoon rabbit free-for-all from NetEnt. 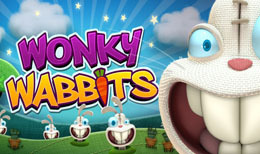 Wonky Wabbits is an online 5 reel slot game filled with carrots, juicy tomatoes, and eggplants. The frog-eyed crazed wabbits are hungry and want to steal your fortune, match the vegetables today and earn yourself some crunchy free spins and cash rewards. 20 years of quality gaming prowess, encompassing 170 casinos, hundreds of incredible titles, and continuously rapid growth. NetEnt are certainly pioneers in the online casino industry, with games powered by their cutting-edge gaming platform, and their titles engineered to keep ahead of the curve – keeping us eager gamers steeped in what is current, and what is coming next, constantly. It’s not the most peaceful afternoon on the expansive fields of the digital casino world today – that’s because spring has sprung, and the Wonky Wabbits have sprung loose from their home and are busy gobbling up all the crunchy vegetables they can find! Brought to you by NetEnt, Wonky Wabbits is a playful plethora of cheeky cartoon “wabbits” and their endless haul of veggie delights, spinning and landing and charming us into a wonky frenzy of fiendish gaming joy! The light-hearted layout and upbeat SFX of Wonky Wabbits make it a great game for a cheeky spin when we’re feeling lucky – although the stitches that hold him and his symbols together suggest there may be something more sinister at foot! The standard symbols here in this 5 reel, 15 payline slot are the 10-J-Q-K-A, while the wonky wabbit himself is more interested in the proposition of a fresh carrot, tomato, corn, broccoli, or aubergine. The Wild symbol here is pretty obvious (it says WILD! ), but if it lands and lands you a win, you’ll get to see Wonky Wabbit himself devouring a selection of crunchy vegetables as our prize pot jingles delightfully up and up! We can have a maximum of 10 coins per line – with each coin ranging from a value of £0.01 to £0.50 – so the stakes are never going to be too high that we miss out on the fun of this whimsical, albeit extremely wonky, wonderful little game. Wonky Wabbit unfortunately doesn’t seem to want to give us any free spins, but with the regularity with which he tends to pay out, this minor issue is never anything more – what it does do is give us provide us with an abundance of entertainment, excitement, and fun. An interesting feature is that wins come in both directions on Wonky Wabbits – right to left and left to right both pay – which actually doubles the number of paylines to 30. There is no mystery to Wonky Wabbits - it does exactly what you’d expect. With its cartoonish visuals and quirky soundtrack, it keeps a smile firmly fixed on your face as you spin – and you’ll probably find yourself bobbing your head gleefully along in time to the music! What this online slot lacks in narrative, it certainly makes up for in its rewards. While it appears simplistic in nature, when those Wilds start to land you can see the complexity and meticulous design that NetEnt have put into this aesthetically amusing title. The loveable rogue “Wabbit”, who hosts the game is as engaging a character as you will find in an online slot, and while he may appear to be a tad unstable, he certainly makes up for it when he chomps away those chunky vegetables and pays out in genuine hard cash!